While working on the identifying of the possible surprise to the 1907 Rose Trellis Egg, I noticed the Empress in the same photo wearing a brooch or pin that resembled a four-leaf clover. Imperial Egg lovers know what that means, the surprise to the 1902 Clover Leaf Egg. Could it be? Or is this just too good to be true? 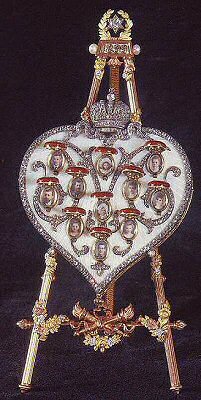 On the other hand, the same goes here as with the 1907 Rose Trellis Medallion, how many four-leaf clover jewels with miniatures could the Empress have had in 1908? And was she not only wearing a portrait of her only son, but of all her five children that day in June 1908? Below is the image of the Empress Alexandra Feodorovna while visiting Reval (now Tallinn, Estonia) in 1908. This visit was besides a state visit, a family meeting too as the Russian and British Royals were closely connected. She is wearing what my fellow researcher Greg Daubney and I think is the medallion that was the surprise from the 1907 Rose Trellis Egg. See that story here. Now quick forwards, or better backwards, to the 1902 Clover Leaf Egg. (Photo courtesy Humus777) Click image to see large version. 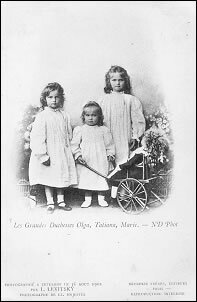 In 1902 when the Clover Egg was presented, the Imperial couple had four children, the youngest Anastasia being born in June 1901. 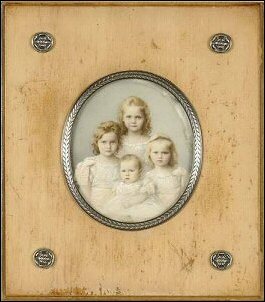 The four daughters were immortalized in paint on a miniature in a wooden (Fabergé ?) frame. This frame Greg Daubney found on the internet. I could not track it down to a real source, only found it on Pinterest. The postcard to the right of the frame, is an official photograph made by L. Levitsky on August 16, 1901. The postcard I found on Les Derniers Romanov.com under 1901. When you click the photo on that page, you will get a larger version and can read the text. I think that the miniature in the wooden frame above, is based on the 1901 photograph, with baby Anastasia added to the miniature, as she was too young (two months) when the official photo was made. 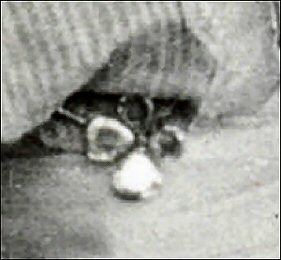 I think the same photograph was used for the miniatures in the brooch, or pin the Empress used the four-leaf clover for. From the 1899 Pansy Egg, we know that Fabergé was capable of making these extremely small miniatures. Fabergé scholar Ulla Tillander-Godenhielm wrote me about the jewels the Empress is wearing on this occasion: It is more than logical that the empress could not 'favourize' one of her children, albeit the boy was the long-awaited heir to the throne. Of course she would also wear a jewel linked to her four daughters on this state visit! Thus, I think we now know more or less what the surprise to the 1902 Clover Egg looked like, but as I said, you have to have some imagination and unless we find a real good picture of the Empress wearing the same four-leaf clover, or even better the jewel itself, we will never know. Therefore we need help from the public, from you, Romanov and Fabergé lovers. We are searching for a good image of a four-leaf clover, preferably by Fabergé, with 23 diamonds, rose-cut diamonds and 4 miniatures, as was written down by Fabergé on the invoice for the 1902 Imperial Easter Egg. Your reward will be eternal gratitude from all Fabergé Imperial Egg lovers! 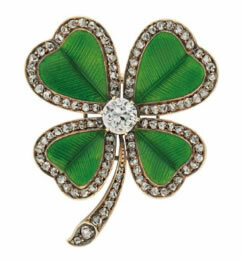 At Christies in London, in November 2018, a jewelled and guilloché enamel gold brooch in the form of a four-leaf clover, by Fabergé with the workmaster's mark of Mikhail Perkhin was sold. 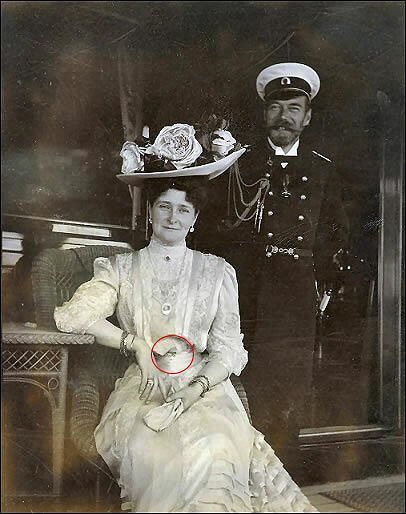 The design looks very familiar to the jewel the Empress was wearing in Reval in 1908 and perhaps a clue that the brooch or pin was indeed made by Fabergé.